We all know I'm the world's best mom. I do all kind of great things for my kids and as a someecard says, I "give them love, nurturing, and just as much dysfunction to make them funny." So I'm at the Bloggess' reading at Blue Willow Bookstore on Tuesday night for her new book, "Let's Pretend This Never Happened" and my niece and the kids went with me. The kids were so excited when they saw that Copernicus had made the trip too so I took this picture of them. A guy and a girl that worked at the shop were cracking up at their antics and because they knew who Copernicus was. I told them that yes I let them read The Bloggess sometimes, because I'm a bad mother like that, but I figure they will exposed to things anyway in life. They agreed and while I clicked the picture I heard them laughing at how silly my children are and I overheard one of them say that when they see kids with that kind of sense of humor it gives them hope for the future. Awww!! 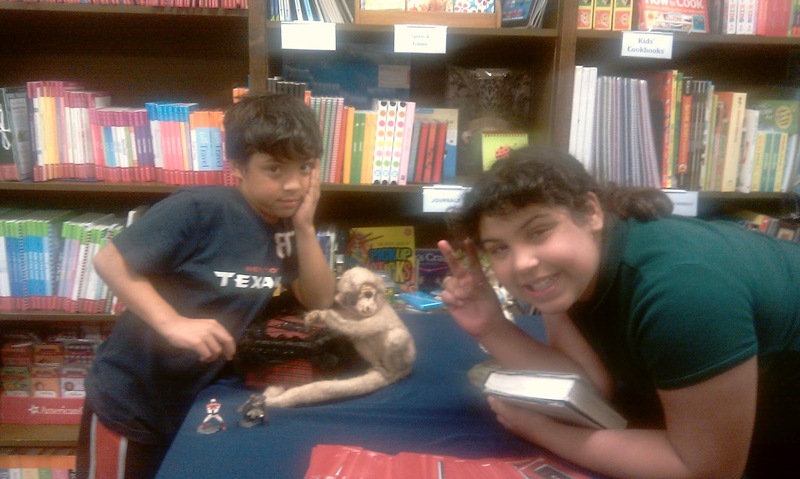 He told them that we went to a reading and I pulled up this picture on my phone. Then he tells them that he had seen Copernicus and they were confused and said that Copernicus had died a long time ago. So he clarified that Copernicus was a "homicidal monkey." At that point they both looked at me with concern in their eyes and I knew then that they knew that yes, I am the problem, because I expose children to inappropriate things. I felt like saying, "Don't mind us, we'll be leaving now." I gathered up Seth and we ran out of there. There's a reason why my kids have a unique sense of humor. When my daughter asked me today what was my favorite word my reply as I drifted off to sleep was, "Macabre." On Friday I got out of teaching a class and I had a couple of missed calls so I checked my voice mail. And there it was... The call we had been waiting for all week. The call telling us that Miranda made it into our first choice middle school for Vanguard. I was thrilled!! Apparently they moved down the waiting list quickly because Miranda was #65. The voice mail message said that I have until 8 a.m. on Monday to accept the invitation. Just on a fluke that they were still there working late I called. Of course they weren't working on a Friday at 5:30 so I left a voice mail message for the Vanguard coordinator and also followed up with an email. I'm making sure I cover all my bases and I'm calling again to confirm at 7:30 on Monday. After that excitement I debated how I would surprise my little girl. I didn't want to just call and give her the news over the phone. I finally decided on some cupcakes from Kroger so I called my niece Hannah who takes care of her and her brother after school and told her that I'd be a little late. I had already worked late for a Friday too. 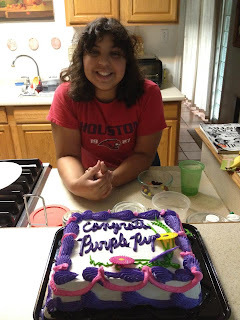 So I ran off to Kroger but when I got there I saw this cute little purple cake (above) and I asked the cake lady if she could add something real quick. She said she could and I debated what to write. I didn't want to just write a lame, "Congrats on Lanier" and "Congrats on Being Accepted at Lanier" just seemed way too wordy for such a little cake. Finally I remembered that their mascot was the Purple Pup. That just seemed very appropriate and I knew that it would take her a minute to get the message when she saw it. My plan worked. When she saw the cake it took her a full 5 seconds to get what I really meant. When she realized that she'd been accepted she jumped for joy. I was so happy for her! It was so worth the wait and getting the cake. One of the wonderful joys of motherhood. I know that Lanier is a really great school (not only one of the best Vanguard schools in HISD but also one of the best city wide) and I want for her to have the best foundation now for her future. That little girl has big goals and I want to give her all the support that I can as her mother. I want her to achieve more than I did because that's how it should be. Hugs to my big girl! Just yesterday I was blogging about my daughter going off to Vanguard kindergarten. I was blogging about the Vanguard test and waiting to find out what school she would be attending. 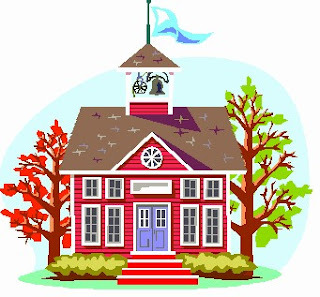 I've blogged about public education and the Vanguard system several times over the years. Well here we are SIX YEARS later and we are in the waiting place waiting to find out what middle school Miranda will be attending. We didn't have as many choices inside the loop, as we did the first time around for elementary school. We really only had one first choice. The others were okay choices, but not the best. We had one great choice for a magnet school back-up and thank goodness she did get into that one. However, she was wait-listed #65 for the our first choice Vanguard school. What does this mean? When you apply for Vanguard you have to list your 3 school choices in order of preference. First they check all your test scores, report card grades, and teacher recommendation to see if you even made it into Vanguard. Next they do a lottery. They choose their designated number of students and wait list all the rest who want to go to their first choice school. We received a letter on Monday telling us that Miranda was accepted into the Vanguard program for middle school, however she was #65 on the waiting list for her first choice school. Maybe that has something to do with the fact that our first choice school is also everyone's first choice school. My initial reaction was sadness and then as the day went on, and via facebook conversations and comments, I found out that #65 is actually really good. I found out that the school got as high up as #242 on the waiting list last year. How is this possible? They send out the letters and parents start calling in to accept or decline. Once they have all the replies on April 9 they start calling down the waiting list. So that's when we get called. One mom told me that anything under 100 is "golden." Now to wait until April 9 to get the official offer so we can celebrate!